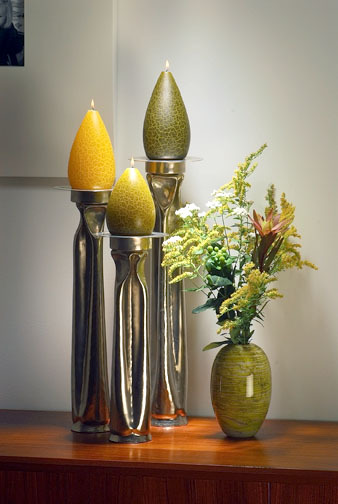 At Barrick Design Candles, we create unique artisan candles to add a modern, contemporary touch to any room. We pride ourselves on creating exquisite candles with a stylish yet functional design orientation. Our unscented candles are ideal for celebrations, holidays, and everyday use. Handcrafted in our Lancaster studio, our candles add a touch of elegance to any room. Barrick Design Candles are as aesthetically pleasing as they are functional, which makes them ideal gifts for a myriad of occasions. They are wonderful as decorative accents in any interior whether contemporary or more traditional. We make candles in over 30 color groups with several shades of most colors so that people can find a color that enhances their space. Moreover, our candles have a distinct crackle pattern, ensuring that they look phenomenal in various room styles. For more than 30 years, Barrick Design Candles have been proudly crafting simplistic and elegant candles. Purchase our candles from the many fine home design and craft stores across the country that carry our candles or through our online store. All artwork, designs, images, written material or text, on this website are Copyright protected. Any infringement, use, reproduction or storage of the materials contained within this site without expressed written consent from Barrick Design Inc. is a violation of the law and enforceable by International Copyright Law.